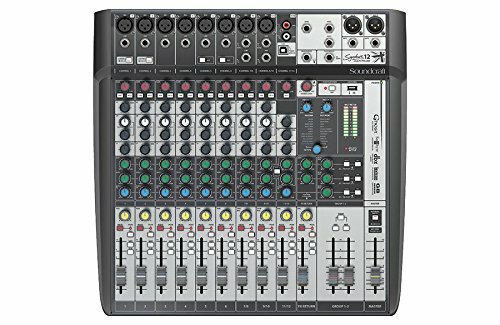 What Is the Soundcraft Signature 12 MTK? Who Is this Mixer Designed for? Conclusion – Is the Soundcraft Signature 12 MTK a Good Choice for You to Consider? Soundcraft has been in the business of manufacturing, designing, and importing professional audio equipment since 1973 and is known for having discriminating taste. They were the first to produce a mixing console that was built into a flight case and have worked hard to improve their design and create equipment that is not only powerful but also intuitive. They provide hard-working musicians with incredible mixing capabilities during any show, and their powerful Signature 12 MTK is a great example of the incredible work that they do. The Soundcraft Signature 12 MTK is one of two mixers in the Signature MTK Series released by Soundcraft. These mixers, the Signature 12 MTK and Signature 22 MTK, have an integrated multitrack USB interface, and can all stand their own against digital mixers. They were designed specifically for musicians who needed to mix, record, and even produce their own custom and signature sound. They are powerful pieces of equipment. Even though the Signature 12 MTK is a little smaller and has a little less power than the Signature 22 MTK, it’s still great for musicians of all skill levels. This mixer is designed for any musician who wants to perform live, practice with their band or by themselves, edit and mix their music, or is interested in recording their own songs. It’s a powerful piece of equipment that is surprisingly easy to use. Because it’s designed specifically for life on the road without being damaged or requiring expensive maintenance, this is a great piece of equipment for any touring or gigging musician. Additionally, it’s powerful and reliable enough to be used in one location without being taken on the road. It’s a great option for churches or schools who need equipment for bands or other performances. Because it offers 10 channels and incredibly easy recording and playback via USB, it’s perfect for beginners who don’t have a lot of experience with this type of equipment. Like most mixers, the Soundcraft Signature 12 MTK ships by itself. This means that you will need to have your instruments and cables on hand to be able to use this piece of equipment. However, since you do not need any hardware to connect your mixer to your instrument, you can start using it right away. The Soundcraft Signature 12 MTK is packed with great studio-grade effects. This makes it easy to add modulation, reverb, chorus, and more to tracks without worrying about the sound quality or the tracks sounding amateur. In addition, the Signature 12 MTK has incredible limiters on input channels. This results in controlled levels, which is really beneficial for beginners. Another great feature is that instruments can be connected to the Soundcraft Signature 12 MTK. This means that musicians don’t need any other hardware. Instead, musicians can enjoy great sound from their Hi-Z inputs that have been optimized for bass, electric guitar, and acoustic guitar. One feature that proves that this equipment was designed for musicians on the go is the durable chassis. It’s been built for taking the Soundcraft Signature 12 MTK on the road without worrying about it being damaged in any way. The metal construction, as well as the high-quality components, are designed to stand up to life on the road without problems or maintenance. The Soundcraft Signature 12 MTK features impressive audio routing. The flexible pre and post switching that is on each Aux helps musicians to easily control their sound. Finally, the Signature 12 MTK has a two-channel USB interface. This makes it easy to play music directly from your computer or to create a mix when recording live music. Since this mixer ships with Ableton Live 9 Lite DAW software, users can easily mix and manipulate their sound. The Soundcraft Signature 12 MTK is a really powerful mixer that is a great option for many musicians, but beginners may find it difficult to afford the higher cost of this equipment. In that case, the Soundcraft EPM8 is a great option. It’s an eight-channel mixer that provides great power and control but doesn’t come with the higher price tag of the Signature 12 MTK. Another wonderful alternative is the Zoom LiveTrack L-20. Musicians who are looking for more channels than the Soundcraft Signature 12 MTK offers will appreciate that this powerful mixer offers 20. It also features six different headphone outputs, and all of them have a savable and customizable mix. This means that this piece of equipment is better suited for professionals or more advanced musicians who have greater needs than the Soundcraft Signature 12 MTK simply can meet. The Soundcraft Signature 12 MTK is a wonderful choice for any musician who is in the market for a powerful and reliable mixer that will make it possible for them to create a custom sound. It’s durable enough to be taken on the road without any fear of it being damaged but is powerful enough to act as the main mixer at a church, if desired. Thanks to how flexible this mixer is, it’s a great option for use in many different situations, giving musicians complete power over their sound. It’s priced a little higher than some other available models, but thanks to the multiple channels and great legendary British sound that it produces, it is a clear choice for many people and definitely worth a second look.